Statue of Liberty is back to doing what he does best – producing winners. Off the scene for a couple of seasons, Statue’s ‘return’ crop of 2YOs are humming along steadily with the likes of black typer, Octane Flyer, Baker Boy, Ile Aux Cygnes, Liberty, New York Rain and Spirits Dance all saluting in recent months. 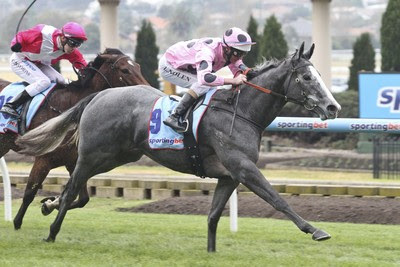 And, on Saturday, Miss Steele joined the pack with a resounding win at Moonee Valley. Talented filly Miss Steele made amends for her luckless debut run with her win in the Sportingbet Handicap today at Moonee Valley, but trainer Mick Kent has no doubt the filly should be undefeated. Kent blames himself for Miss Steele’s first start loss at Flemington in mid May when he instructed Glen Boss to ride the filly with a sit and she raced too keenly. He said if he had told Boss to let her bowl then he thought she would have proved too strong. “She just got crowded up and he (Boss) had to go for her very early,” Kent said. Kent said he waited for Saturday’s race as it carried $30,000 in VOBIS bonus, which netted connections $78,000. He said he would continue to race Miss Steele, a daughter of Statue of Liberty, in similar VOBIS races for the rest of the season. Miss Steele, a drifter from $2.80 to $3.20, accelerated through a narrow opening at the 200 metres to win softly by one length from Magnaro, $4.40, with a half length to the heavily supported Romancingthestone, which was backed from $3.30 to $2.90 favourite. Jockey Luke Nolen said he could have moved three deep with about 600 metres to travel, but said he elected to track Romancingthestone, which had speared to the front. Nolen said the filly needed an “ounce of luck”, but when the opening appeared in the straight she quickly took it. “All in all, I thought the win was quite sound,” Nolen said. Miss Steele is out of the Shagny mare, Shu’ Shu’ Lara and is raced by her breeders: the Zitos, Cichellos and Buttons.